The Intel Atom Z3785 is a power efficient quad-core SoC for Windows and Android tablets. It is clocked at 1.49 - 2.41 GHz and part of the Bay Trail-T platform. Thanks to the specially optimized 22 nanometer low-power process (P1271) with tri-gate transistors, performance and energy efficiency have been significantly improved compared to its predecessor. Compared to the Z3775, the Z3785 offers slightly increased clock rates for the CPU, GPU and memory controller. 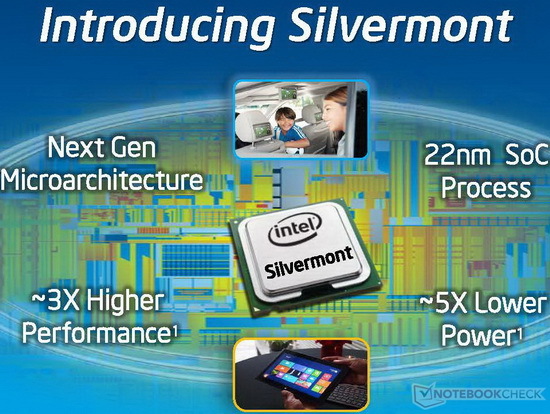 The processor cores are based on the new Silvermont architecture, which is an out-of-order design for the first time. The increased utilization of the pipeline and many other improvements (optimized branch prediction, increased buffers, enhanced decoders) have increased the performance per clock by about 50 percent. At the same time, however, the Hyper-Threading feature of the previous generation has been removed. Other major changes are the support for new instruction set extensions such as SSE 4.1 and 4.2 as well as AES-NI (depending on the model). Thanks to 4 CPU cores and a clock speed of 1.49 - 2.41 GHz, the Z3785 is significantly faster than previous Intel Atoms, e.g. the Z2760. The Z3785 even beats some of the Kabini APUs like the AMD A4-5000, as well as ARM SoCs like Tegra 4 and the Snapdragon 800. For everyday tasks such as Internet or Office the performance is adequate, but not for very complex (Windows) software or modern games. The HD Graphics (Bay Trail) is based on the Intel Gen7 architecture, which supports DirectX 11 and is also found in the Ivy Bridge series (e.g. HD Graphics 4000). With only 4 EUs (Execution Units) and a relatively low clock speed of up to 833 MHz, the GPU is even slower than the HD Graphics (Ivy Bridge) and comparable to the Qualcomm Adreno 320 (as found in the Snapdragon 600). Therefore, only older and less demanding Windows games will run fluently. However, video acceleration and display resolutions up to 2560 x 1600 pixels are no problem for the chip. The entire SoC is rated at an SDP of 2.2 watts, which indicates a TDP of less than 4 watts. Thus, the chip can be used in passively cooled tablets. The Intel Atom Z3735F is a power-efficient quad-core SoC for tablets (mainly Android). It is clocked at 1.33 - 1.83 GHz and is part of the Bay Trail-T platform. Thanks to the specially optimized 22nm low-power design process (P1271) with Tri-Gate transistors, performance and energy efficiency have been significantly improved compared to its predecessor. In contrast to the Z3735D, the Z3735F comes in a different BGA package. The processor cores are based on the new Silvermont architecture, which is an out-of-order design for the first time. The increased utilization of the pipeline and many other improvements (optimized branch prediction, increased buffers, and enhanced decoders) have increased the performance per clock by about 50 percent. At the same time, however, the Hyper-Threading feature of the previous generation has been removed. Other major additions are the support for new instruction set extensions such as SSE 4.1 and 4.2 as well as AES-NI (depending on the model). Thanks to 4 CPU cores and the improved performance per clock, the Z3735F is significantly faster than previous Intel Atoms like the Z2760. Depending on the benchmark, the Z3735F competes with AMDs Temash and Kabini APUs like the A6-1450 and A4-5000. For everyday tasks such as Internet or Office the performance is adequate, but not for very complex software or modern games. Compared to ARM SoCs for Android systems, the Z3735F is placed in the upper mid-range segment. The HD Graphics (Bay Trail) is based on the Intel Gen7 architecture, which supports DirectX 11 and is also found in the Ivy Bridge series (e.g. HD Graphics 4000). With only 4 EUs (Execution Units) and a relatively low clock speed of up to 646 MHz, the GPU is even slower than the HD Graphics (Ivy Bridge). Therefore, only older and less demanding games (like simple Android titles) will run fluently. However, video acceleration and other multimedia applications are no problem for the chip. The entire SoC is rated at an SDP of 2.2 W, which indicates a TDP of less than 4 W. Thus, the chip can be used in passively cooled tablets. The Intel Atom Z3740D is a power-efficient quad-core SoC for Windows and Android tablets. It is clocked at 1.33 - 1.83 GHz and is part of the Bay Trail-T platform. Thanks to the specially optimized 22nm low-power design process (P1271) with Tri-Gate transistors, performance and energy efficiency have been significantly improved compared to its predecessor. In contrast to the Z3740, the Z3740D only offers a single-channel memory controller and a lower display resolution. Thanks to 4 CPU cores and the improved performance per clock, the Z3740D is significantly faster than previous Intel Atoms like the Z2760. According to our benchmarks, the Z3740D even competes with AMDs Temash and Kabini APUs like the A6-1450 and A4-5000. For everyday tasks such as Internet or Office the performance is adequate, but not for very complex software or modern games. The HD Graphics (Bay Trail) is based on the Intel Gen7 architecture, which supports DirectX 11 and is also found in the Ivy Bridge series (e.g. HD Graphics 4000). With only 4 EUs (Execution Units) and a relatively low clock speed of up to 688 MHz, the GPU is even slower than the HD Graphics (Ivy Bridge). Therefore, only older and less demanding Windows games like World of Warcraft or Fifa will run fluently. However, video acceleration and display resolutions up to 1920 x 1200 pixels are no problem for the chip.